Qatar Airways is the national airline of the State of Qatar and is one the fastest growing airlines in the history of aviation. The carrier is a Skytrax certified 5 Star airline and now flies to more than 150 global destinations. Last year, Qatar Airways carried more than 30 million passengers and has won a host of awards for its excellent standards of service. If you’re attending an Assessment Day for Qatar Airways you’ll be expected to have an in-depth knowledge of the airline – and assume that knowledge will be checked. Use this quick cheat sheet to get all the key facts, figures and insider knowledge to impress the recruiters. Age: 23 years old. The airline was founded as a small, regional carrier in 1994. It relaunched in 1997 with the vision to become a leading, international airline. Parent Company: Qatar Airways is part of the Qatar Airways Group. Other key companies in the group include the airline’s home airport – Hamad International Airport, Qatar Airways Cargo, Qatar Executive and Qatar Duty-Free. Ownership: Since 2013, Qatar Airways has been fully owned by the Government of Qatar. Annual Passenger Numbers: In 2015-2016 the airline carried more than 30 million passengers – Up 4 million on the previous year. Qatar Airways Group CEO: His Excellency, Mr Akbar Al Baker – Joined the company in 1997 when it relaunched as an international airline. Al Baker has been instrumental in shaping the development of Qatar Airways into one of the fastest growing and most highly acclaimed airlines in the world. Employees: Approximately 45,000 employees work for Qatar Airways group. Of those, 31,000 are airline staff. Employees represent 160 nationalities and speak more than 120 languages. The Qatar Airways Logo: The logo features an Oryx (a type of Antelope) – the national animal of Qatar. Qatar Airways now flies to over 150 destinations worldwide. Despite recent sanctions that have hit the airline’s schedules, Qatar continues to open up new routes. Prague, Skopje and Kyiv have joined the network in 2017. For the remainder of 2017 and going into 2018, the airline plans route launches to Canberra, Australia; Chiang Mai, Thailand; Rio de Janeiro, Brazil; San Francisco, U.S. and Santiago, Chile. There are only a handful of airline’s around the world who have been officially certified as a 5 Star airline – Qatar Airways is one of them. The airline frequently receives rave reviews from even the most discerning of air travellers. Qatar Airways was awarded the World’s Best Airline 2017 by Skytrax. The brand new QSuite Business Class seat is a major milestone for Qatar Airways. The level of comfort and privacy this seat provides is truly groundbreaking. The airline was also the global launch customer of the world’s newest widebody aircraft – the Airbus A350. 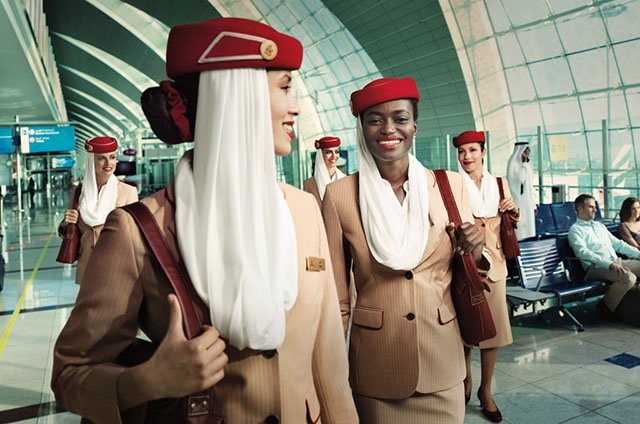 Qatar Airways is credited with having some of the most professional and highly trained cabin crew in the industry. 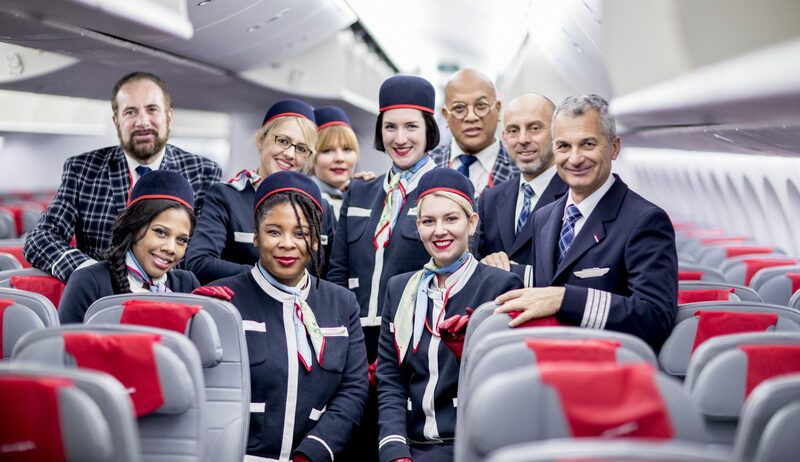 As such, the airline has frequently picked up awards for the service provided by its cabin crew. Qatar Airways as we know it today was established just 23 years ago. In 1994 the airline began operations as a small, regional airline with only a small number of routes. However, things were to change in 1997 when His Highness The Father Emir, Sheikh Hamad bin Khalifa Al Thani outlined a new vision for the national airline. He reconceived Qatar Airways as a leading, international airline that distinguished itself by providing the highest standards of service and excellence. Instrumental to the success of Qatar Airways has been the leadership of His Excellency Mr Akbar Al Baker. Al Baker has overseen the expansion of the airline into a Skytrax certified 5 Star airline that now serves over 150 global destinations. In 2011, Qatar Airways was named as Airline of the Year and retained the accolade in 2012. It again won the award in 2015 and 2017. 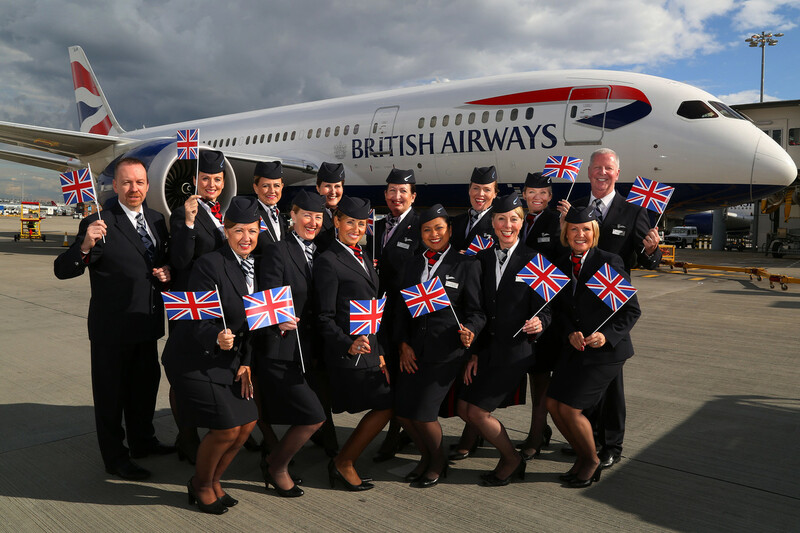 In 2013, the carrier joined one of the largest airline alliances in the world – the OneWorld alliance. It remains the only Gulf carrier to be a member of a major alliance. To this day, Qatar Airways continues to expand at a phenomenal pace. In 2016, the carrier placed an order for 100 Boeing aircraft valued at $90 billion USD. It’s fleet now numbers 192 aircraft with a total of 350 aircraft on order. 29th July 2017 – Plans to launch flights to Canberra – Qatar’s fifth destination in Australia. This add’s to Qatar Airways list of new destinations in 2017. These include Nice and Dublin in June as well as Prague and Kyiv in August. Recently, Sohar became Qatar’s third destination in Oman. 21st June 2017 – Qatar Airways is awarded the title of Airline of the Year at the prestigious 2017 Skytrax World Airline Awards. The airline also won the awards for Best First Class Airline Lounge, Best Airline in the Middle East and World’s Best Business Class. 30th March 2017 – In response to a controversial new electronics ban on direct flights between Doha and the United States, Qatar Airways offers free laptops for guests travelling in Business and First Class. 28th March 2017 – Qatar Airways wins the title of ‘Airline of the Year’ at the Air Transport Awards 2017. It was recognised for its “innovation, service, hospitality and leading product design”. 09th March 2017 – A new Business Class seat is unveiled at ITB Berlin. Dubbed the ‘QSuite’, the new seat features the industry’s first-ever double bed, privacy panels and the ability to turn adjoining seats into a private suite. 06th February 2017 – A new service between Doha and Auckland, New Zealand makes Qatar Airways the holder of the world’s longest flight. The flight takes 17 hours, 30 minutes and covers a distance of 14,535 kilometres. It is operated by a Boeing 777 aircraft. 09th January 2017 – New amenity kits have been introduced in Economy Class. The bags feature an inspiring image of a destination that Qatar Airways flies to. 01st January 2017 – First and Business Class passengers will now be provided sleepwear designed by UK-based The White Company. BRIC’S and Castello Monte Vibiano Vecchio will provide new amenity kits in Business Class. November 2016 – Eight new destinations are announced for 2017/2018. Canberra, Dublin, Las Vegas, Rio de Janeiro, Santiago, the airline’s third destination in Indonesia; and Tabuk and Yanbu, the 9th and 10th destinations in Saudi Arabia. The Qsuite, a revolutionary Business Class seat is launched. It will initially appear on Qatar’s London and Paris routes before being extended to New York and beyond. Qatar Airways breaks the record for the longest commercial flight with its service from Doha to Auckland, New Zealand. The airline’s home, Hamad International Airport becomes a Skytrax awarded 5-star airport. Short and medium haul premium passengers get their own amenity kits supplied by Nappa Dori. BRIC’S and Castello Monte Vibiano Vecchio will supply the business class amenity kit on long haul flights. In a partnership with Giorgio Armani, luxurious fragrances and beauty amenity kits are available to First Class passengers. Qatar Airways offers sleep wear, designed by exclusive British brand, The White Company for both Business and First Class passengers. The airline took delivery of its first Airbus A380 in 2014. There are now eight of the aircraft in the fleet. 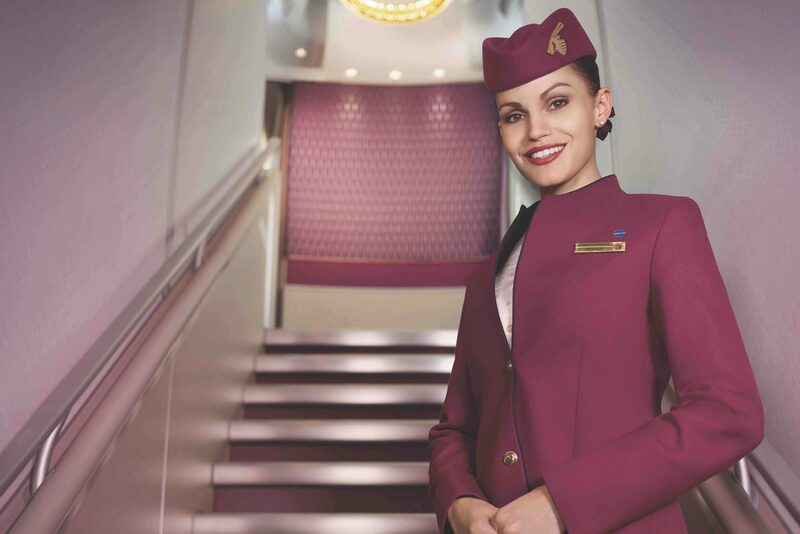 Qatar Airways has three official classes of travel – Economy, Business and First Class. However, with the range of aircraft in Qatar’s fleet, there is some variation in product and service on different aircraft and routes. Even economy class passengers get an exclusive amenity kit with Qatar Airways. The kits come in a simple bag, featuring a picture of a destination that Qatar Airways flies to. Each kit contains an Institut Karité Paris lip balm, a Miradent dental kit, eye mask, socks and ear plugs. For entertainment, passengers can enjoy up to 3,000 options on the OryxOne in-flight entertainment system. And for younger passengers, Qatar Airways has a deal with toymaker, Hasbro to provide complimentary games and toys including Mr Potato Head, Monopoly, Connect 4 and Twister. If that wasn’t enough, most aircraft feature power sockets, USB charging outlets and WiFI on select aircraft. Qatar Airways has one of the best Business Class products in the skies. In fact, the airline picked up the award for World’s Best Business Class at the 2017 Skytrax World Airline Awards (and that’s just the latest in a long list of similar awards for its Business Class). Earlier this year, Qatar Airways unveiled its brand new Business Class seat – the QSuite – each seat is a private suite with privacy door and a large, lie-flat bed. The product is unique in that a group of four suites in the middle of the cabin can be turned into a ‘private lounge’ with passengers able to share the same space. On aircraft which haven’t yet been fitted with the QSuite, Qatar Airways still offer guests lie-flat seats with direct aisle access. Even some of the airline’s smaller Airbus A320’s feature lie-flat seats in Business Class. On the airline’s Airbus A380 aircraft, Business Class passengers also gain access to the onboard lounge and bar, as well as a ‘dine anytime’ menu. The QSuite could be a revolutionary product but for now, Qatar Airways still has First Class cabin’s on a large percentage of its long haul aircraft. 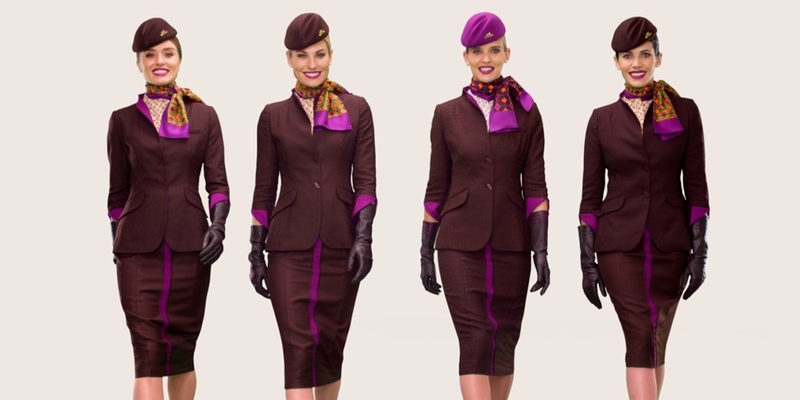 Again, Qatar Airways has picked up plenty of awards for its First Class product. These include Best Airline for International First Class at the 2016 Global Traveller Magazine awards. First Class passengers also gain access to a luxurious lounge at the airline’s hub at Hamad International Airport – and yet another award winner. Most recently being named as Best First Class Airline Lounge at the 2017 Skytrax Awards. In October 2013, Qatar Airways became the first and only major Middle East airline to join an established airline alliance. As a member of the Oneworld alliance, Qatar Airways joined 13 other airlines that together serve 1,015 destinations in 157 countries. As an alliance, Oneworld describes its offering as providing an “incomparable route network, focused on the world’s leading business cities.” The alliance was originally formed in 1998 with a vision to make global air travel smoother, easier and of greater value to travellers. The airline’s in the alliance cooperate on schedules, services and ticket sales. Member airline’s also recognise the status of passengers who have accrued points with another airline in the alliance – offering reciprocal benefits like access to Business Class lounges. Burgundy: All new members enter at this level. There are very few benefits but it will give you waitlist priority and family members can add their QMiles into one, shared account. Silver: At this level, members receive access to Business Class lounges and an extra baggage allowance of 10kg on top of the normal limit. Gold: Members are able to take one guest into the Business Class lounge and their excess baggage allowance goes up to 15kg. Platinum: This is the top tier and it allows members to take two guests into the lounge. The excess baggage allowance is a hefty 20kg at this level. Qatar Airways helps the charity by highlighting its works in its range of in-flight magazines and via the airline’s OryxOne entertainment system. The airline has helped raise $2.6 million USD for the programme since the partnership began. Recently, the airline distributed 10,000 books to disadvantaged children in New York City as part of its ‘Qatar Airways Summer Reading Program’. Number of Destinations: Qatar Airways flies to 150 destinations from its hub at Hamad International in Doha. Qatar Airways is one of the fastest growing airlines in modern aviation history. Despite being denied access to Saudi Arabia, the UAE, Bahrain and Egypt due to a diplomatic rift, the airline is redeploying aircraft to new destinations. In recent weeks Prague, Skopje and Kyiv joined the Qatar Airways route network. For the remainder of 2017 and going into 2018, the airline plans route launches to Canberra, Australia; Chiang Mai, Thailand; Rio de Janeiro, Brazil; San Francisco, U.S. and Santiago, Chile. Qatar Airways currently operates a fleet of 180 aircraft with an average age of just 5 years. The fleet has grown rapidly since the airline’s inaugural flight – starting with just four aircraft in 1997, the airline grew to 28 by 2003 and 50 by 2006. And the expansion isn’t expected to slow down anytime soon – Qatar Airways has 110 next generation Boeing 777X aircraft on order 61 cutting edge Airbus A350’s still to be delivered. A further 191 aircraft for both short haul and long haul routes are have also been ordered by the airline. Qatar Airways utilises a mix of both single aisle and dual aisle aircraft. For its short haul services, the airline is primarily an Airbus operator but it also has orders for the popular Boeing 737MAX aircraft – the latest version of this single aisle aircraft has an extended range and very low per passenger costs. Qatar Airways has 80 A350s on order and the airline played an active role in the development of the aircraft. Each A350 will be configured in a two-class formation with 36 seats in Business and 247 seats in Economy Class.